Last Monday, former featherweight and lightweight UFC champion Conor McGregor tweeted out that he was calling it a career. However, not everyone is sold on that notion. That includes UFC President Dana White. McGregor has recently mentioned wanting his share in the UFC to compete in anything less than main event bouts. Obviously, this is a bit of an extreme idea. “No,” White responded to 8 Las Vegas when asked if he thought McGregor was really retiring. 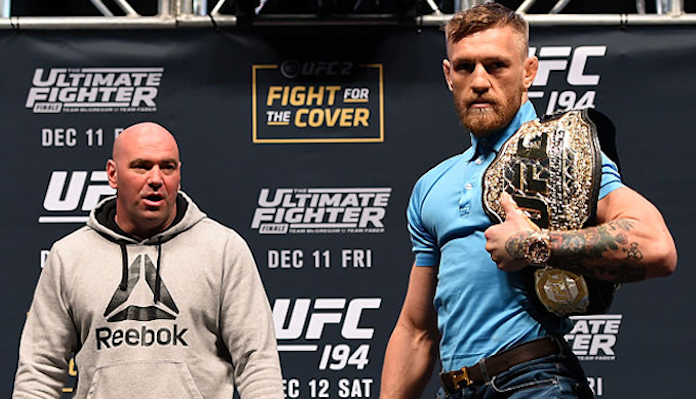 “I think there’s some things that Conor wants. I think that Conor wants to get together, face-to-face, he and I, and we probably will in the next couple of weeks and we’ll get this thing figured out. “I mean listen, who gets respected more than Conor McGregor does? Come on. The guy’s never been disres… Definitely not by me. And he’s got a lot of money too. He’s stuck on this thing where he wants a piece of the ownership. If you look at basketball, Michael Jordan didn’t own a piece of the league. Is Conor very valuable to the sport and to the brand [of] the UFC? Of course, he is. But that’s a tough one. I think there’s other ways we can make him happy. In the midst of all of this, McGregor currently finds himself being investigated in Ireland for a sexual assault case that allegedly took place in December. Currently suspended for his partaking in the UFC 229 post-fight brawl, McGregor will be free to fight again by the end of this week. After negotiations for a fight with Donald ‘Cowboy’ Cerrone went south, Cerrone was then matched with Al Iaquinta as the main event of UFC Ottawa on May 4.